A research team led by Prof. Dr. Winfried Römer and Dr. Elias Hobeika from the University of Freiburg and the University Medical Center in Ulm has discovered a mechanism with which bacteria activate white blood cells and attack an organism’s immune system. The scientists recently published the results in the journal Science Signaling. The bacterial species Burkholderia ambifaria belongs to a group of bacterial strains that can cause infections in immunocompromised hosts. These bacteria produce so-called lectins, proteins that bind to carbohydrates. Among other things, lectin BambL is able to bind to the B-cell antigen receptor (BCR). This protein is located on the surface of B cells, which belong to the white blood cells. The antigen receptor consists of a variable and a constant region that also carries several carbohydrate residues. With its variable region, it specifically binds antigens, which also include pathogens. Inside the cell, it serves as a docking site for further molecules that trigger signaling processes in the immune cell. B cells are activated and mature into effector cells, the so-called plasma cells, which produce large amounts of antibodies against pathogens. The researchers found out that lectin BambL binds to the carbohydrate residues of the antigen receptor in a controlled and artificial environment and thus activates the B cells: “We were surprised that a bacterial lectin initiates the strictly regulated antigen receptor signaling pathway,” says Dr. Isabel Wilhelm, a first author of the study. 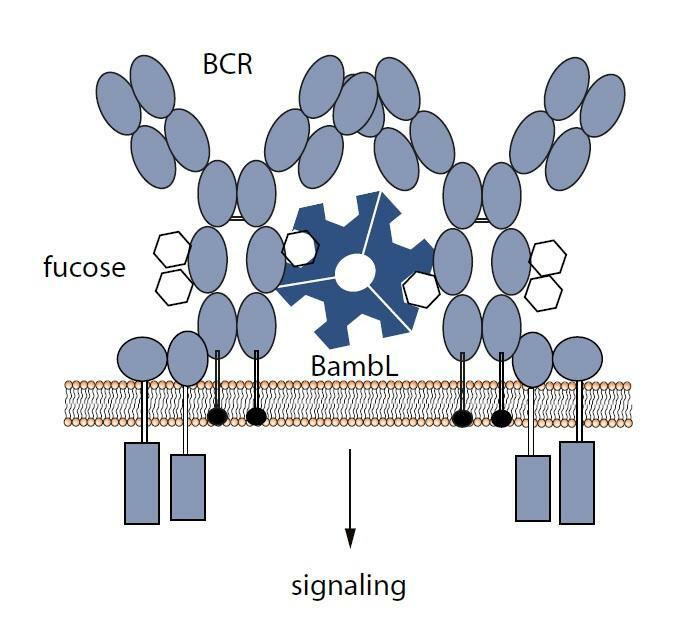 Prolonged stimulation with BambL led to the rapid death of the white blood cells. The process was only possible in cells with an intact antigen receptor. The lectin injection into mice led to an immune response within three days, which showed increased amounts of B-cells in the spleen and their decrease in the bone marrow. Symptoms decreased in animals with fully functional immune systems within seven days. “However, there may be a risk for immunocompromised patients if they are unable to build up an effective response to pathogens,” says Dr. Ella Levit-Zerdoun, another lead author of the study. Researchers from the BIOSS and CIBSS clusters of excellence in biological signaling research, the Spemann Graduate School of Biology and Medicine at the University of Freiburg, the Max Planck Institute of Immunobiology and Epigenetics and the University Medical Center in Ulm were involved in the work. The discovery of the mechanism provides the team with the opportunity for further investigations. The focus will be on the effects of the Burkholderia ambifaria pathogen on humans, possible preventive measures and treatment methods.